According to C-JeS Entertainment, the band's agency, JYJ will attend a video conference interview for Singapore on Sept. 26followed by media and cultural events in Vietnam and Guangzhou, China, on Oct. 24 and Nov. 21, respectively. About 40,000 fans went to the concert which was participated in by 20 K-pop groups including Girls' Generation, Super Junior, KARA, FT Island, EXO, miss A, BEAST and 2AM. According to the 2014 Incheon Asian Games website, the concert "was part of a series of events to mark the one year remaining until the opening of the Games on September 19, 2014." "Of course, we have raised a formal objection to the organizing committee because, from a common sense point of view, it is unacceptable for JYJ, honorary ambassadors of the IAG, not to attend the event which has to do with promoting the IAG," C-JeS said, according to a translation by fansite Jaetaku on Wordpress.com. 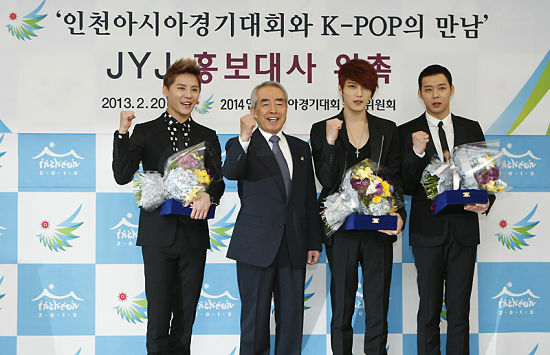 According to C-JeS, the committee's request was not for JYJ to perform at the concert but only to introduce the Incheon Asian Games and announce their upcoming overseas promotional activities. MBC and IDTC turned down the committee's request, C-JeS said. Last July, Korea's Fair Trade Commission issued an order against entertainment and media organizations in Korea that have obstructed JYJ's TV appearances. "JYJ are going to do their best to spread the excellence of the Korean culture and to raise the awareness of the IAG 2014 as its honorary ambassadors by making a tour of several Asian countries," the agency said.